Adding a Slave drive, a secondary hard disk drive (HDD), to your PC is not an extremely complicated process. You will find many good reasons to add a second HDD as a 'slave' drive. IT Professional have found it better to save downloaded files to a separate drive which does not contain your operating system files. This not only helps protect your operating system files from potential virus attack, it provides an easily accessible place to store any and all non-essential or non-program files. Once you have followed this tutorial, don't forget to create a Download Folder on your slave drive and direct your downloads to it. For added safety, set your antivirus - antispyware program to scan those files before opening them or running any install executables. The last step of this tutorial explains why and how to move your Pagefile to the slave drive. 1. Purchase an internal or external HDD compatible with your operating system. 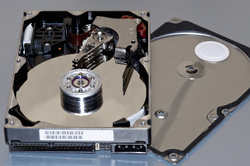 Beginning in January 2011, hardware Manufacturers began changing the way they made hard disks. These newer drives store information in 4KB blocks instead of the 512 byte blocks older drives used. The larger block size reportedly allows information to be stored and accessed more efficiently. All operating systems prior to Windows Vista and Windows 7 still use the smaller 512 byte block capable drives. These will undoubtedly become rare items as Manufacturers cease to make them entirely. 2. Set the jumpers on the back of the HDD's to Master and Slave, accordingly. With Windows 7 & 8, it is not necessary to set the pin designation; the operating system will automatically recognize the addition as a slave. One HDD will connect to IDE1 while the other connects to IDE2. You will find this channel separation especially important when relocating the pagefile. A customized PC with more drives than either data cable or IDE slot can support will require the installation of a Ultra ATA/133 PCI Raid Controller or similar, UNLESS you are using an external USB HDD. CD drives, zip or tape drives should be set to cable select or slave, when attached to the same data cable as either of these HDD. 4. Format to NTFS, after wiping a disk drive, or installing a fresh one. NTFS, a more secure format than the much older FAT or FAT 32 file format. The NTFS format, while ideal for file storage, does not hinder program function. Everything from Windows 98 to Windows 8 uses the NTFS file format. 5. Relocate your Pagefile from the Master to the Slave to improve overall performance, provided the HDD's are on separate channels. Format an additional partition onto the Slave Drive to hold the pagefile and nothing else. Size the pagefile and partition according to your physical RAM. For example, if you have 4 GB of RAM (the most XP Pro 64-bit can utilize), set the maximum pagefile size to 4 GB and the partitioned space 4 GB plus 1 MB or 5120 MB. Placing the Pagefile in the Partition by itself supposedly keeps it from becoming fragmented. Don't forget to zero out the Pagefile allocation for the Master Drive. Right-click My Computer and navigate through (System)Properties/Advanced/Performance Settings/Advanced - to change your Virtual Memory (Pagefile) settings. Reboot the computer to implement the changes. * Upgrade your power supply to support the additional load. * If you want a Slave Drive to install a secondary operating system (O/S) as a Dual Boot; you'll need third-party software, such Neosmart's Easy BCD, to add an O/S choice to the Boot screen. Otherwise, your machine will only Boot to the last O/S installed, due to the bootloader being overwritten. * SSD - Prices of Solid State Drives are dropping! Silent and more secure with AES 256-bit full-disk encryption. * Unplug your power supply and ground yourself to the case, when working inside of your computer tower. Static electricity can damage internal components.